In the wake of Dr. George Abawi's retirement and a reduction in staffing, the Bloat Nematode Testing Lab in Geneva has deferred testing to the lab at Michigan State University for the time being. Samples sent to Michigan will cost $75 dollars each. This is 3 times the in-state rate due to state subsidies for Michigan growers and the need for APHIS approval to accept samples from outside the state. Michigan State sample submission form can be found here. On the Michigan form, the nematode testing information is towards the very bottom. Please remember to triple the rate if sending samples to Michigan. 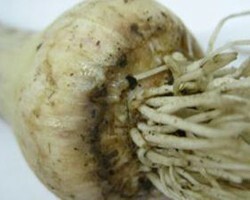 As in previous years, if trying to detect Bloat Nematode, select suspicious bulbs for testing. Growers are encouraged to sample different plantings separately, selecting 10 representative bulbs per planting per sample. Soil should be tested to a depth of 6-8 inches, and in 10+ sites through the suspect field then mixed before bagging. Make sure samples are secured against leaking or damage during shipping. Garlic samples should be surrounded in a layer of absorbent material such as paper towel. Soil should be placed in a Zip-Loc bag and should not be dried before shipping. The lab is not offering certification; they are simply providing results based on the sample received. Cornell Lab and Extension staff, as well a garlic grower advisory group, will work to determine if the lab at Geneva will be able to return to accepting all of New York's samples next year, and what the cost will be. If you have any questions about this process or sampling, please contact Crystal Stewart, Vegetable Specialist with the Eastern NY Commercial Horticulture Program at 518-775-0018 or, in the Cornell Vegetable Program region, contact Robert Hadad or Christy Hoepting.